Chauvet, a leading manufacturer of LED lighting, has announced the arrival of a new lighting effect ideal for Mobile DJs. The ‘Sweeper LED’ has six 3W pods of tri-coloured LEDs contained in a single casing which sweep fat, crisp, round beams of colour across the floor. Each pod can be individually controlled for amazing colour chases, sequences and effect combinations. Another stand out feature can be achieved in master/slave mode. The master and slaved units can run as mirror images of each other, allowing you to make complex looking shows and effects with just the touch of a button. In other words, you can run pod six to pod one, then pod one to pod six and invert your show automatically. Sweep the crowd, floor, stage or room with one easy-to-use, compact, multi-beam effect light. 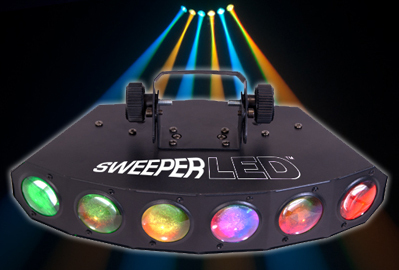 The ‘Sweeper LED’ also has sound-activated and built-in automated programs and up to 20 units can be power linked to save on setup time.